BOSTON — If weather forecasts are to be believed, it doesn’t appear there is any chance of a white Christmas in the Greater Boston area this year. It’s a big, grand musical based on the classic 1954 Paramount movie starring Bing Crosby and Danny Kaye, the kind of show that’s almost too expensive to stage these days. 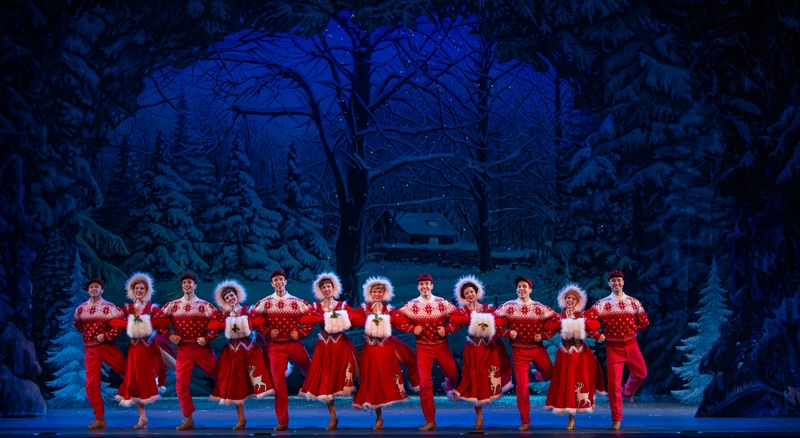 It features a cast of 28 singing Irving Berlin’s nonpareil score — which includes “Sisters,” “Happy Holiday,” “Counting My Blessings,” “Blue Skies” as well as the iconic title tune — played by a big, bold brassy orchestra. The cast includes attractive principals, some wizened old pros in key character roles, and even a charming kid. The paper-thin plot is actually more a clothes hanger to hang the gorgeous productions numbers on, a variation on the old Mickey Rooney-Judy Garland MGM “Let’s put on a show” theme. Ten years after they were a song and dance team in the Army, performing for their fellow soldiers during World War II, it is 1954 and the song and dance team of Bob Wallace (James Clow) and Phil Davis (Jeremy Benton) have made it big on Broadway and TV. Before embarking on a Christmas visit to Miami from New York City by train, they decide to act on a tip from an old war buddy and check out a sister act — the Haynes Sisters — for their upcoming revue. They are dazzled by the act (“Sisters”) and Phil and Judy Haynes (Kaitlyn Davidson) hit it off quickly, while Bob and Betty Haynes (Trista Moldovan) get off to a rocky start. The sisters are headed to Vermont to perform over Christmas, and Phil decides he and, unbeknownst to him until it’s too late — Bob — will follow. The “Snow’ number is a fast, funny production number that takes place on the train. Once they get there, they find there’s no snow thanks to a warm spell and the inn run by their former company commander in World War II — General Henry Waverly (Conrad John Schuck) — is in dire financial straits. Bob and Betty have become a couple — but are quickly uncoupled by a misunderstanding. The boys and the girls organize a show to raise money for the general, and send out an SOS to former Army buddies to come to Vermont and help save the day. ‘White Christmas” is one continuous holiday card, thanks to the dazzling costumes by Carrie Robbins, the well-appointed, colorful sets by Anna Louizos that get better as they go along, until a towering Christmas tree finally gives way to a Currier & Ives scene of a snow-laden Vermont countryside for the finale (“I’ve Got My Love to Keep Me Warm”). There are several characters straight from Central Casting. Pamela Myers is Martha Watson, the crusty “concierge” at the inn who — as luck would have it — happens to be a former song and dance star named “Megaphone” Martha Watson, modeled after Ethel Merman. Cliff Bemis has some fun first as “The Snoring Man” in the “Snow” number on the train and then as the inn’s handyman/lights and sound man, Ezekiel Foster, fashioning an accent not found in nature, sort of Downeast Maine meets “Darryl, Darryl and My Other Brother Darryl” from TV’s “The Bob Newhart Show,” which also took place at a Vermont inn . And where would we be without the requisite cute, star-struck kid, in this case Susan Waverly (Elizabeth Crawford), the general’s granddaughter. The tap numbers are simply wonderful. 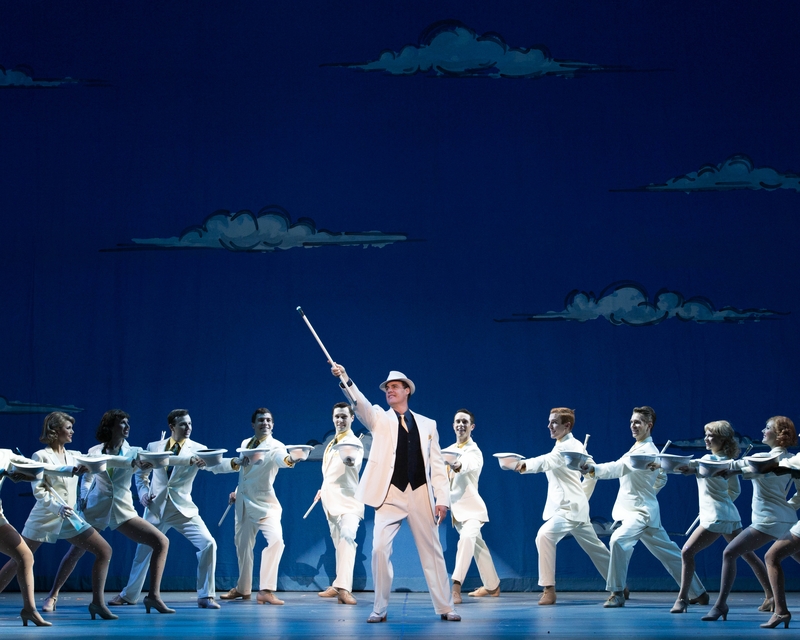 The “Blue Skies” tap number that caps the first act is just a marvelous display of skill, precision, and stamina. Yes, it will snow at the conclusion of “White Christmas,” thanks to a high-tech contraption called a “Snowmaster 3000,” a foam snow machine originally developed for theme park attractions and “foam parties” at nightclubs. “White Christmas” is a good-hearted, good-humored and often spectacular way to send those holiday humbugs scurrying for cover.